Trek have recently been busy building one of the most comprehensive adventure and touring bike line ups around. 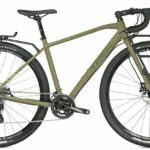 There are now SEVEN different bikes, including the 2016 Trek 920, which are suited to everything from road touring right through to adventure off-road. I’ve put this resource together to guide you through the different models and help determine what might best suit you. 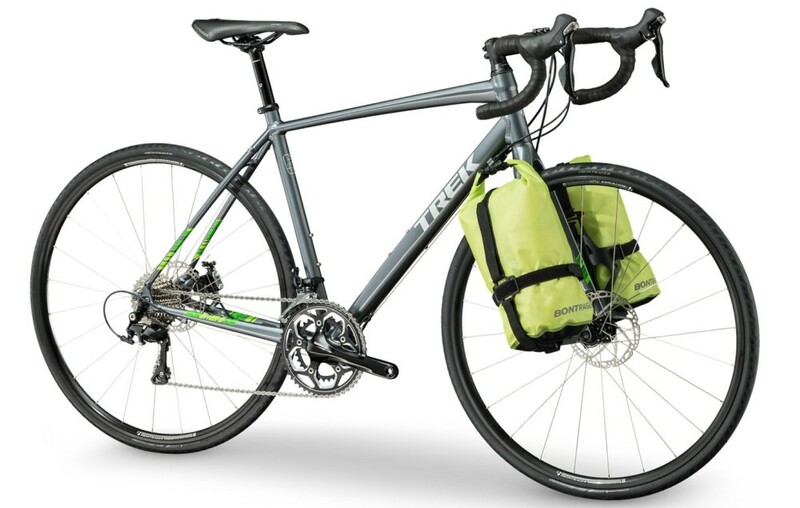 The 2016 Trek 920 Adventure Touring Bike. The 2016 Trek 920 is a tweaked mountain bike with a drop handlebar. It’s designed around wide, knobby mountain bike tyres which can take you to more places than slicks. It uses a mountain bike drivetrain and wheels, in combination with drop handlebars and bar-end shifters. Although the 2016 Trek 920 is best suited to off-road riding, a swap-out to slick tyres would make it an exceptional long-distance touring bike. The geometry is actually prime for heavy-loaded touring with it’s high ‘fork trail’, long chainstay/wheelbase and tall front end. That said, the gearing is optimised around lower speeds, so the 42t front chainring may have you spinning a bit on road descents. The bike price including front and rear racks is US $1989. The 2016 Trek 720 Light Touring Bike. The 720 is one of Trek’s lightweight touring options. 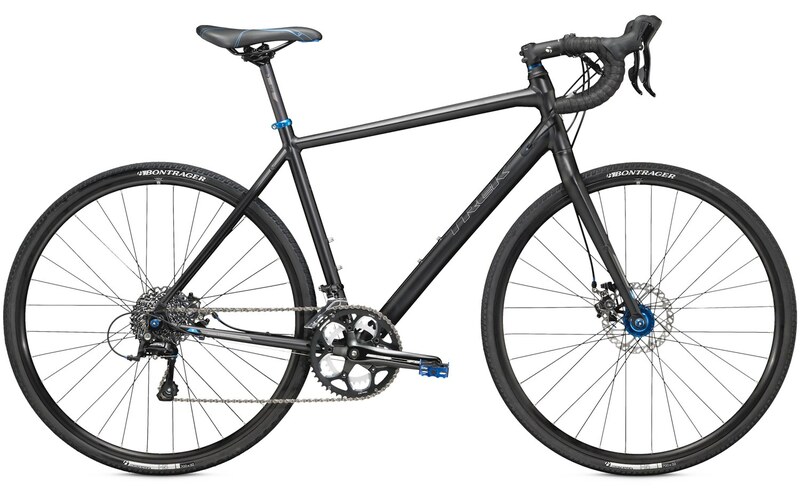 It uses an alloy frame and carbon fibre fork to keep the weight down (11kg or so), making it a great multi-purpose bike like the Cannondale Touring. 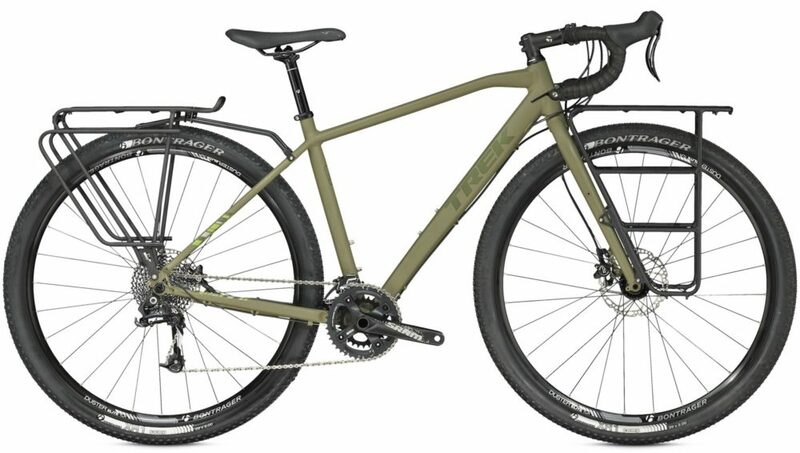 It comes with Shimano 105 11-spd gearing, TRP Hydro/Cable disc brakes and some front side-mount racks and dry bags. The 720 is best suited to smooth roads with a lightweight load, although it’s a really sturdy bike and will handle front and rear panniers if you needed. It’s smallest gear is 29 gear inches, which is a little large for really steep hills including a load, but will be fine for most touring. There are eyelets for racks and fenders. The price is US $1889 including the front dry bags. The 2016 Trek Crossrip LTD Light Touring Bike. The 2016 Trek Crossrip Elite Light Touring Bike. The 2016 Trek Crossrip Comp Light Touring Bike. The CrossRip is almost identical to the 720 in every way – it even uses the same aluminium frame tubing and carbon fibre fork. The geometry is ever so slightly different between the bikes; you’d be pretty hard pressed to notice the subtle differences. The most noticeable difference may be the 5mm taller and longer front end of the CrossRip. The likely reason for Trek having these two near-identical bikes is so they can market the bikes in two separate bike categories (fitness and touring). Like the 720, CrossRips are most at home on a smooth road with a light load but will handle four panniers well. The bikes use either compact or road triple cranksets, working with wide-range cassettes to achieve a lowish drive gear (close to 1:1 / 29 gear inches). The bikes have eyelets for racks and fenders. The CrossRip is available in three different builds. 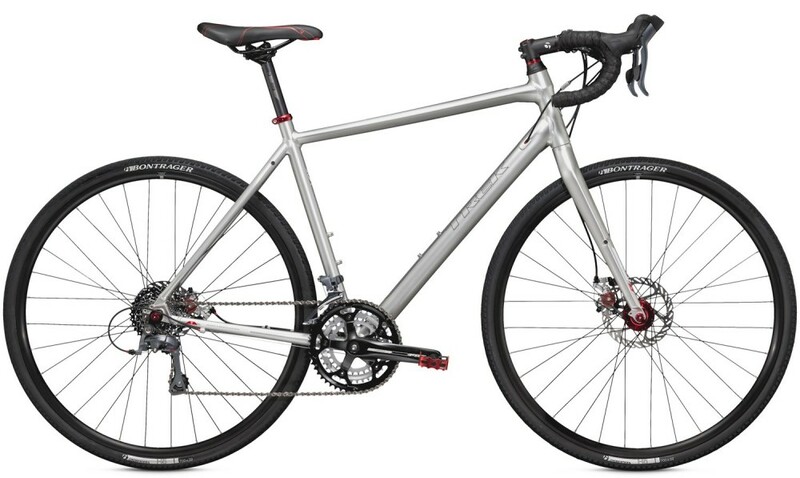 The LTD comes with Shimano 105 11-spd gearing and TRP Hydro/Cable disc brakes and is priced at US $1679. Next up, the Elite uses Shimano Sora 9-spd gearing and cable disc brakes and is US $1199. For a bit less money again, you can get the Comp with Shimano Claris 8-spd gearing at US $1099. If you’re tossing up between the CrossRip LTD and 720, go the CrossRip as it has a US $200 price advantage! 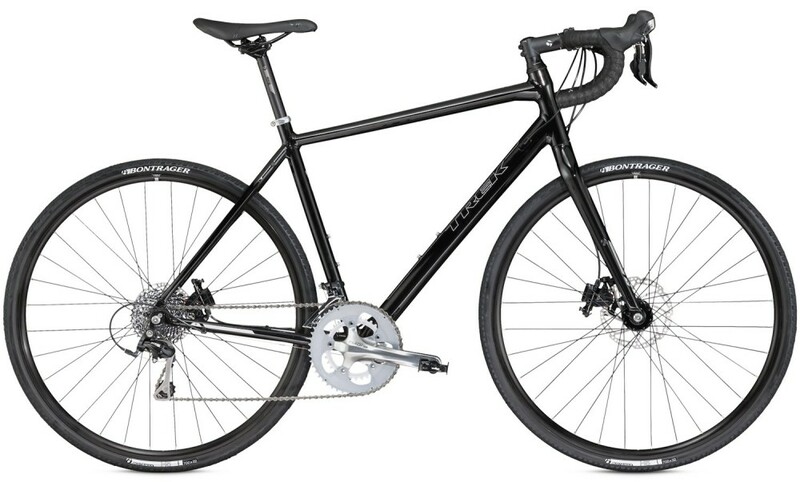 The 2016 Trek 520 Disc Long Distance Touring Bike. 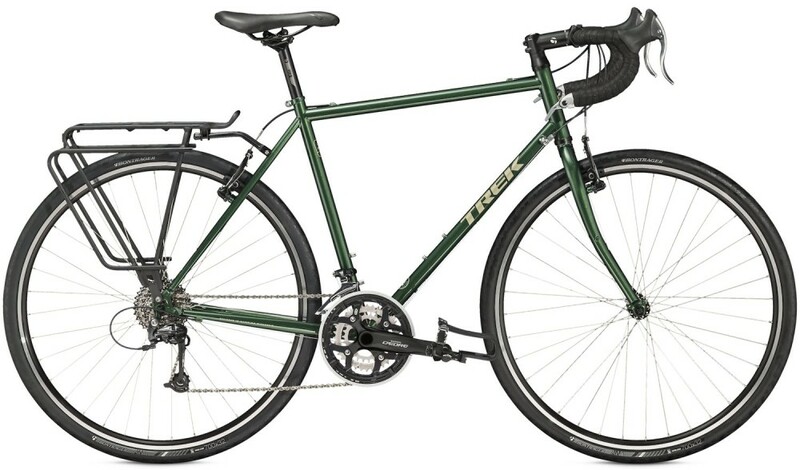 The 2016 Trek Long Distance Touring Bike. The 520 has been in the Trek line-up for 33 years! It’s actually the longest running model in Trek’s bike range. As you can imagine, the geometry of the 520 has been refined a lot over this period. The bottom bracket is low, the chainstays are long and the steering pretty slow. All good things for touring. The 520 uses 4130 steel for both the frame and fork. The spec is super simple, solid and reliable with 36 spoke wheels, cable brakes and bar-end shifters. The gear range is exceptional, spanning from 22 to 118 gear inches. This should be enough to climb almost anything with all four panniers, but if you wanted even more low gears you could switch the cassette to a 34t (21 gear inches). The price is US $1259 with v-brakes and US $1359 with disc brakes. My pick would be the disc model!